Dot every "I" and cross every "t."
This particular eclipse is personal for reasons I do not wish to disclose on the open internet. I thought about NOT writing about it and just leaving the 2016 New Moons page and the writings of others (reblogs) as my proxy. But, I changed my mind. And then I found a body of work I had produced on this eclipse a few weeks ago. No written work, mind you, but chart graphics from the time when I developed my analysis of the rather important Grand Quintile of August 28th. That confirmed for me that I needed to put up what I had done in a post. 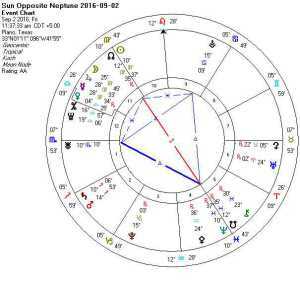 If you kept your notes from Sun Conjunct Neptune on February 28th, then review them now. This is another day that is best for poets and photographers. 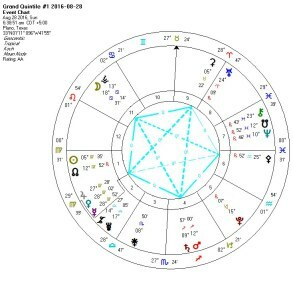 We have a Yod in play, so you may need to make a decision at a time when your decision making is not at its best. A Thor’s Hammer is in play, so you need to watch your temper and watch for others that might be dangerous. But a Kite is also in play, and an opportunity is present. Keep your eyes open lest it pass you by unnoticed. A Grand Quintile forms on August 28th. These are even more rare than the Mystic Rectangles we encountered a few weeks ago. By itself, that would be enough, but…. If you find an affinity for any of these statements it’s good to know what’s ‘in the air’. A good time to: decide which thoughts, or what methods, bring (or will bring) you the most fortunate circumstances in your life – or at least this week. Challenges: Remaining alert to how expressing yourself is worth the risk of creating an unstable situation. Balance: Let go of struggles by trying to see the purpose, or the reasons, behind them. Fly a kite, blow bubbles, feel the wind in your face, do something airy that will help you relax.